With an effective antibacterial system that helps avoid uncontrollable outbreaks of viruses similar to Ebola, there is a very slim chance that the deadly virus from Africa will reach Russia, according to researchers. According to a study published by the Mobs Laboratory at Boston's Northeastern University on Oct. 6, the Ebola virus has a 1 percent chance of appearing in Russia in October. In comparison, there is a 75 percent chance of the epidemic appearing in France. He told RIR that, "there exists a nonzero possibility of the virus spreading to developed countries in Europe, including Russia." 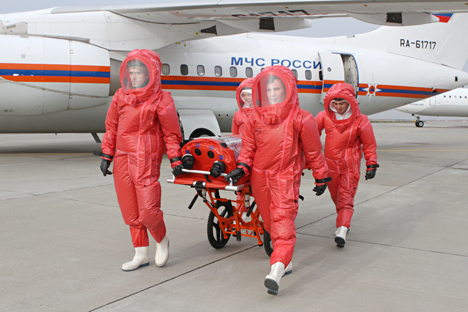 The press office of Moscow’s Sheremetevo International Airport told RIR that as of October 10, "no one has been infected with the virus."